1) Above the eyes of this little marsupial are a pair of white dots, which give the appearance (particularly in the dark) of a second pair of eyes. Hence the name. It’s not a lame insult given to the opossum because they wear glasses (they do not). Although marsupials famously come from Australia, nearly 100 species actually come from the Americas. Nearly all of them have “opossum” in their name. 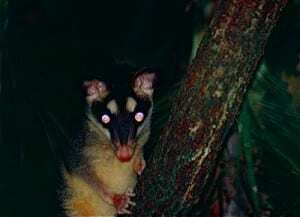 By contrast, “possums” are among the Australian marsupials, which number nearly 200. 2) The oldest known true marsupials are from North America (their ancestors having colonised westwards from Eurasia, to which it was attached around 100 million years ago). From there, around 65 million years ago they spread to South America and went extinct in the north and also in Eurasia. The modern day American opossums evolved from them. One species returned to North America – the Virginia opossum. Some would venture from South America, across Antarctica and onto Australia. Curiously one modern South American marsupial – the monito del monte – appears to be more closely related to Australian marsupials than other South American ones, suggestings its ancestors made the return trip across Antarctica. 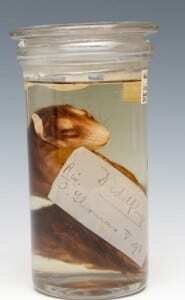 3) This specimen contains two juvenile southeastern four-eyed opossums (Philander frenetus). As shown in the top image, the label reads “O. Thomas. V ’98. Rio” This must refer to Oldfield Thomas (1858 – 1929), a mammal curator at the British Museum (Natural History) – now the Natural History Museum – at that time (May 1898), and Rio as its field collection site. While Thomas is not known to have collected himself, he is known to have spent a lot of money sending collectors to amass specimens on his behalf. It is assumed that this is one such specimen. Given that the only species that lives around Rio de Janiero is the southeastern four-eyed opossum, we have identified it as that. This specimen came to us from Imperial College London, along with hundreds of others, when they closed their zoology collection in the 1980s. We absorbed the collection, but sadly did not receive any documentation about the collection, so we know no more about it. Habits: This animal, which is somewhat larger than a common Squirrel, is very common in many parts of Brazil, where it is known as the Quica. Feeding upon small birds, insects, and fruits, it passes its time, like the others of its kin, in sleeping, rolled up like a ball, during the day, and sallies forth to feed at night. The full development of the pouch indicates that the young have habits similar to those of the common species. By the French, the species is termed Le Didelphe quatre-œil, the conspicuous white spots on the forehead giving, at a distance, the appearance of a second pair of eyes. What can we learn from this, beyond the stated facts? First, that “sallies” is a word too seldom spoken; and second, that the French name for the species has won out over the Brazilian. A gray four-eyed opossum (the species from which the southeastern four-eyed opossum was recently split. Philander opossum. 5) Thomas actually wrote an important description of the four-eyed opossum in 1888. It is extremely similar to what my 1894 book says. So similar, in fact, that in parts Lydekker has copied Thomas’ text but substituted words like “rather crisp” with “somewhat crisp”, when describing the fur (I’m not convinced either are particularly illustrative), or saying it has “variable shades” when Thomas described “variable tones”. This is somewhat reminiscent of students who are copying and pasting Wikipedia but putting 10% effort into avoiding plagiarism software. Lydekker, Richard. 1896. A hand-book to the Marsupialia and Monotremata. London: E. Lloyd. Thomas, Oldfield. 1888. Catalogue of the Marsupialia and Monotremata in the collection of the British Museum (Natural History). London: British Museum (Natural History). Dept. of Zoology. 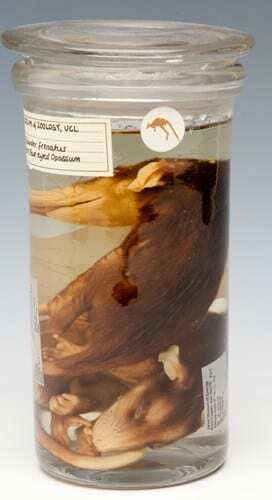 *or Didelphys opossum, as it was known in 1894. As you can see the top label just says “Didelphys”.